Good luck at the show. 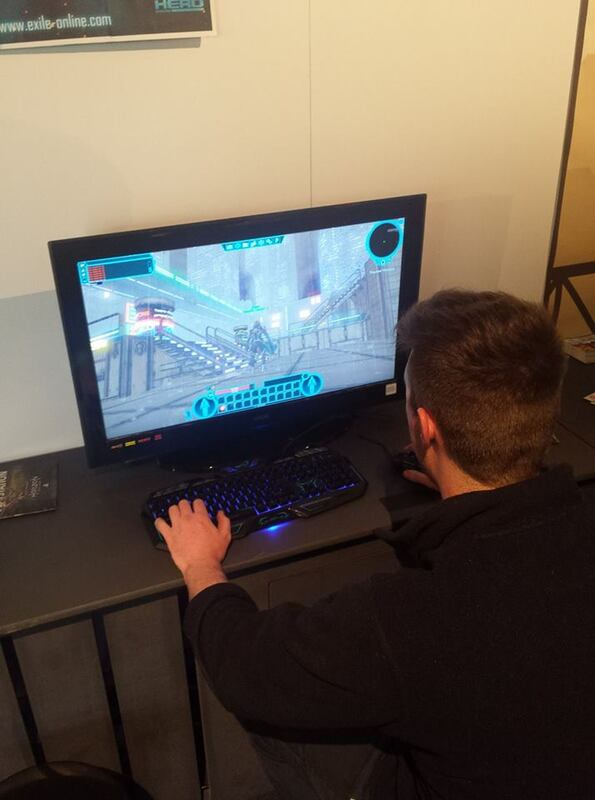 It is a real rush when you get the general public trying out your game and really digging it. We are weathering up and dirtying our textures to make them seem a bit more realistic and less like shiny shiny. Got added to EGXs show-floor section. Cant wait to go and show off the game at the end of march. End of February patch notes. Finally home from EGX and i have had enough catching up on sleep to have recovered a bit. I have set up my PC again in the office so now it is time to let you guys in on what happened in a bit more detail. 6am wake up. Ughh this is way too early. Having packed my suitcase the previous night it only left taking apart my computer setup. EGX had an option to use their hardware, but i decided to save myself a few hundred pounds and use my own stuff. My partner in crime gets to my place just after 8am. We take an hour packing the hardware including my PC tower and a 32 inch TV. Doing a final sweep to make sure i have not forgot anything we start the drive down to London. We are 90 miles north east of the capital stopping for Mcdonalds health food. Thank god for google maps and the satnav app. The drive goes fairly smooth with minimal traffic this time of day. We arrive at Tobacco Docks at about 10:30 am. Lots of time to prep and setup. We park the car in the smelliest scariest multistory car park. £5 a day for parking is quite reasonable for central london. 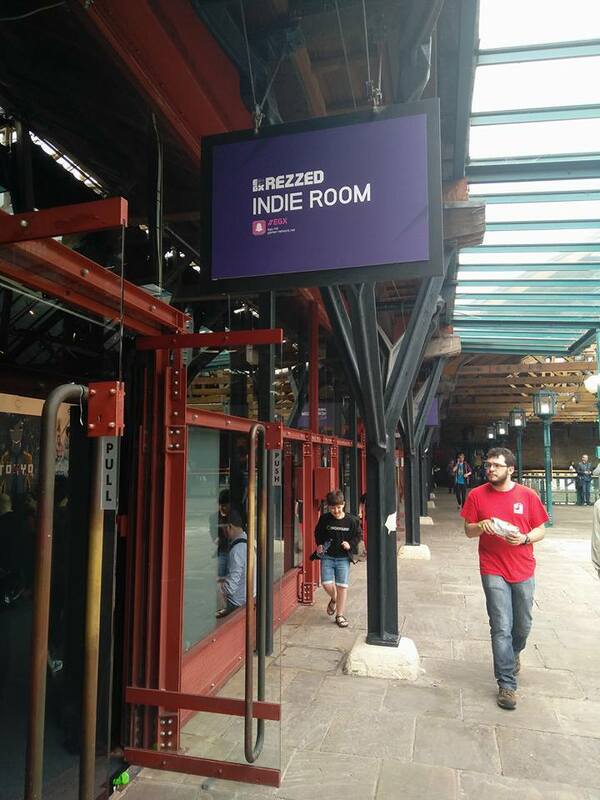 We walk over to Tobacco Docks to collect our exhibitor wristbands. This makes me feel special as it is the first time i have ever done anything like this. The place where we are exhibiting is a nice open area filled with around 50 or so other indie groups. 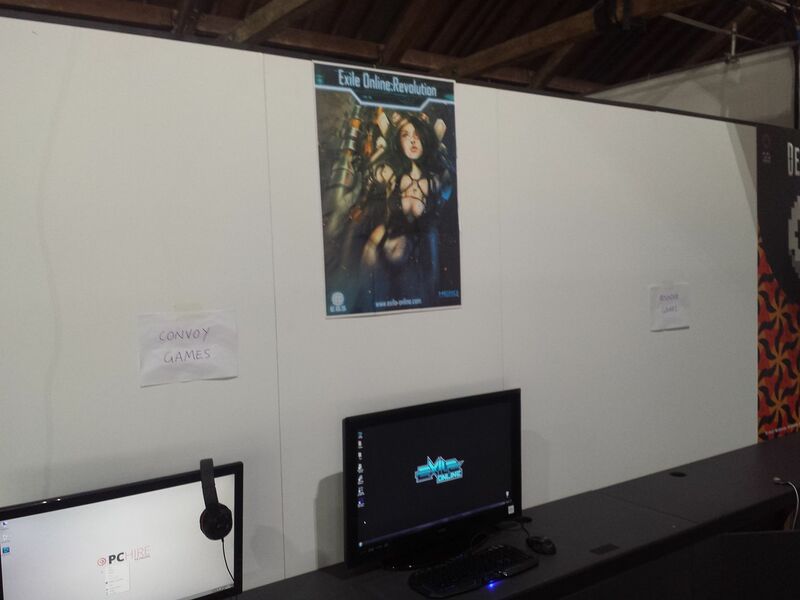 I see that the poster we made is dramatically smaller than the ones that are supplied by EGX but again i decided to use my own as it saved me a fair amount on having them print it off. 3 or 4 hours to set up and make sure everything is as it should be. We leave EGX and drive into the worst traffic i have ever experienced. Our hotel is 14.9 miles away and it takes us 2 and a half hours to get there. While driving we miss a turn off and end up driving through a congestion charge zone and right into the heart of London. If you have seen the part on the Matrix movie where they drive on the motorway, you will get a sense of how bad it is on these roads. We finally arrive at the hotel. Its on a motorway but is nice and quite anyway. We help ourselves to some Burger King and then lounge about till about 9ish. Early start tomorrow so we go to sleep. 6:30 am wake up. This is way too early for my liking. After showering and getting ready, we begin the drive back into London. Again it takes us 2 and a bit hours to travel the 15 miles back to EGX. The show starts at 10am so i am constantly checking the time to make sure we get there and have some last minute tinkering time. We arrive at about 9:30 and walk right past the huge queue. Perks of being an exhibitor haha. It is cool seeing the other indie groups setting up and testing last minute changes and additions. Funny how you see things from the other side. I switch on the computer and everything looks fine. Until...i try and use one of the zone to zone portals. I walk through a portal and it warps me into the central point of the target zone rather than the intended destination that was set up with the teleporter node. This is an major disaster as it means the demo areas are no longer properly linked and i cannot show the game areas as a contiguous set piece. It turns out one of the programmers tinkered with the character creation area scripts which in turn effected the teleporter system. Unknown to him, it meant that the teleports simply warp you into the wrong place, usually underground or in a wall. There is nothing i can do about it other than get demo the game as best as possible. it is quite embarrassing having to use the developer client to change areas rather than use the player client as i had planned. Anyway i make it work and limp along. We get a bit of interest from the public and several different press type people. A few dozen people sit down and have a play. I explain that the mission and NPC systems are not quite completed yet so there is not much to do other than explore the interesting locales (cant even do that properly). I show them the foundations of all the gameplay systems that we have in place and mention why making an MMO has been simplified due to the way Hero Engine is made. Lunch of some mcdonalds (great healthy living) and handing out a few hundred flyers around the venue and it is 6am already. The drive home takes until 20:35. We are both smelly and exhausted and fall asleep as soon as the showers have been had. 4:00 am wake up. We decided after the near miss of the day before with the drive in, that we would wake up early and miss the traffic. This was a good choice as it turned out as i got to EGX at 5:30. Having to wait around till 7 for them to open the doors for exhibitors was nothing compared to sitting in traffic for 2 hours. 2 hours of tinkering time before the 10am start. Having messaged the programmers about the broken teleporters, they had fixed it during the night. Thank god for small miracles. I delete all of the old teleport nodes and activators and hastily set them all up again. I test the teleports between zones and can finally walk between zones normally.This sets me up for the rest of the day where i have a wonderful time showing the game off to its current full potential. Dozens of players have a try, most with very positive feedback as once they get to play it hands on they can see the possibilities of the future of the game. I explain several aspects of the sandbox and various upcoming game features. We hand out a few hundred more flyers. Today is a great day as we get interviewed by several well established press and youtubers including a few that have actually heard of the game and have followed our progress for a couple of years. This is a really great feeling as it lets me know that our hard work has not gone totally unnoticed by the gaming population as a whole. By the time 18:00 hits, i am dead on my feet and my throat it raw from having picked up a throat infection from somewhere. It was worth it. After the last member of the public departs, we start to break down our stand and pack the equipment in the car. Getting out of London by the way we first came in on day 0 is so much quicker than the trip to the hotel. We get home by 20:00 and unload my stuff. It is good to be home. Cant wait to see my fiancee later. Publicity is the hardest part of development now. It has been very hard to break into the realms of virality, where your projects gets noticed and simply starts to generate publicity by itself without any efforts on the developers part. It is up to our fanbase and followers to help us by liking and sharing the more interesting updates and pieces of news or pictures. We cant do it without you guys. After our initial Kickstarter campaign did not receive the full funding, we realised we needed to do a lot more work. This is our first in a series of planned phases of funding on Gofundme. We have decided to divide our goals up into milestones rather than seeking one huge lump sum. This way we can complete planned and announced milestones and prove to our pledges that their funding is being used wisely. The pledge levels will remain largely the same as before and we will increase the pledge levels at a later date to include the larger ones. A like and a share is important to our continued success, so any and all will be appreciated. Any questions please feel free to ask. Thank you. Bah, I know exactly how you are feeling. Kickstarter is tough in that you either achieve the goal or you get nothing, even though there may well have been many people wanting to contribute. Reading your pledge levels on your GoFundMe page, it seems a little redundant to repeat rewards at multiple levels, e.g. "Name in credits and website as founder". If you instead wrote them as something like "all of the above rewards plus..." it might read better. Then people have an better view of what additional things they get as they go to higher levels. As it is now, at a level I am having to sift through the list to tell what is new on that level. Are you considering https://www.indiegogo.com ? I, and maybe others, tend to associate GoFundMe with charitable causes. Regardless, you have some really interesting stuff going on. Good luck with your future campaigns. Just my personal opinion but fundraising like this has died, thankfully. You need to be a well established member in the community to get a successful funding campaign going now. All the small fries like us need to focus on creating content to our niche world and establishing a playable game base that people can see a "tangible" product and want to further its development. This is where HeroEngine is really letting the developers down. We cant produce a game client to the public as freely as you can on other engines. Most of us have alpha/beta games that we cant share with anyone in a production state because there is a major disconnect. We need HeroEngine to allow us an easier way to make a public client available for this kind of testing. Even if that means we have to pay for our own hosting. At least then we can get a community to start backing our small projects and work with us. HE is powerful collaborative for developing but the disconnect to actually getting it in the hands of the players is still too great. I digress but none the less with HE and its model you have to shape your development and funding to to it. Getting to an minimum viable product and having it open to the public takes a lot with HE but you need that before you ask for funding imo. What is the difficulty you are having in distribution? Are you at the point where you have alpha keys to give out? Mmm. Once you are at a level where you have a playable game, HE developers will help you sort that out and go live. Otherwise there is no point in letting your testers test an empty world devoid of art and coding. 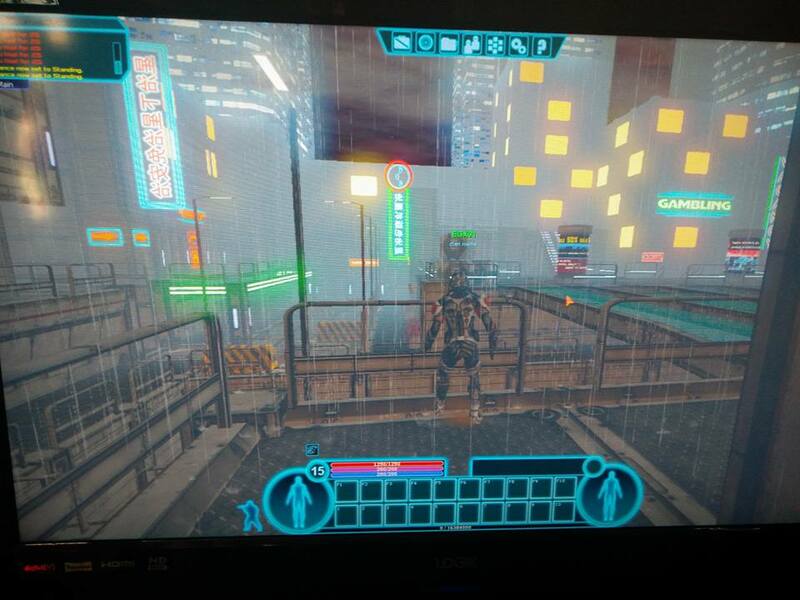 We have started our first small closed alpha. 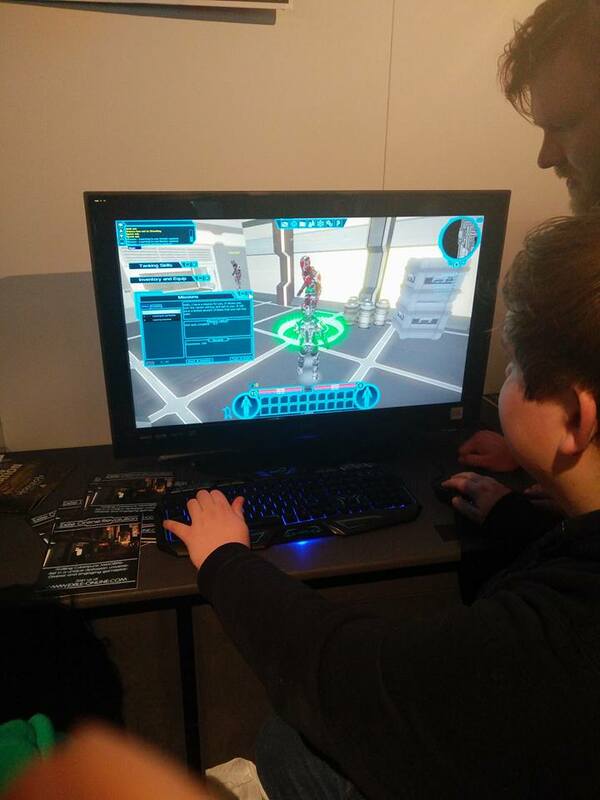 Despite a crop of bugs appearing just before we released, we have had a lot of positive comments from the 20 or so people that have come in and tried the game. We have an active discord with discussion and the testers are testing and breaking things for us to fix. We are proud of where we are and what we have done. Lots still to do. Thank you to the Hero Engine team for supporting us every step of the way.